Bistro 29 has been a friendly neighborhood favorite for years and is committed to serving great food at reasonable prices. Chick Pea Puree, Tahini, Lemon juice, Garlic & Olive Oil. Hummus topped w/Spicy Lamb & Sautéed Tomatoes. Eggplant Puree, Garlic, Tahini & Lemon. Salad of Cracked Wheat, Parsley, Mint, Tomato & Onion. Roasted Red Pepper & Walnut Puree Blended with Olive Oil & Pomegranate Juice. Ground Beef, Crushed Wheat, Pinenuts & Raisins with Yogurt Sauce. Stuffed with Rice & Vegetables. Roasted Eggplant & Onions mixed with Tomatoes, Garlic, Olive Oil & Cilantro. With Garlic, Olive Oil, Thyme, Oregano & Parmesan. Fried Mozzarella with Zesty Tomato Sauce. Tuscan Bread & Vegetable Soup. Mixed Greens with Feta, Tomatoes, Cucumber & Creamy Vinaigrette. Served with a Balsamic Vinaigrette, Marinated Tomatoes & Parmesan Cheese. Sun dried Tomatoes, Balsamic Vinaigrette, Parmesan Cheese & Toasted Pinenuts. House Salad topped with Feta, Tomatoes, Cucumbers, Artichoke & Creamy Vinaigrette. 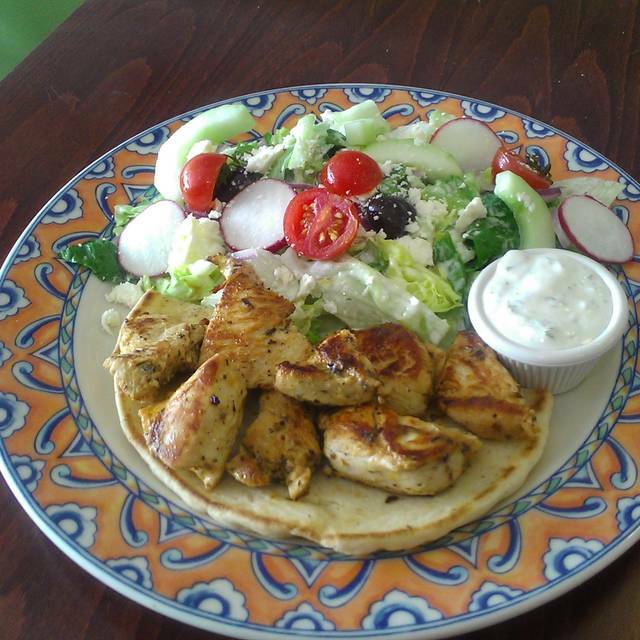 House Salad topped with Gyro Meat & Tzatziki Served with Grilled Pita. Grilled Chicken Breast, Hard Boiled Eggs, Sliced Tomatoes, Cucumbers and Green Beans over House Greek Salad. Grape Leaves, Eggplant Salad, Vegetable Kabob and Hard Boiled Egg with Grilled Pita Bread and the House Mixed Greens Salad with Balsamic Vinaigrette. Sauteed Shrimp with a Lemon Yogurt Dressing over Greek Salad with Balsamic Glazed Tomatoes. Grilled Flat Iron Steak over House Salad w/ Cornmeal Croutons & Calamata Olives. Served with a Mixed Greens Salad & a Citrus Peach & Buttermilk Vinaigrette. Served with a Mixed Greens Salad, Vegetable Kabob & Citrus Vinaigrette. With Roasted Onions, MildChili Sauce & Provolone Cheese. Served with Fries & Salad. Grilled Chicken with Tahini Sauce, Lettuce. & Tomatoes. Served with Fries & Salad. Roasted Lamb with Tahini Sauce, Lettuce & Tomatoes. Served with Fries & Salad. Crispy Croquettes of Chick Peas & Fava Beans. Served with Fries & Salad. Served in Pita Bread with Yogurt Sauce, Lettuce & Tomatoes w/ Served with Fries & Salad. Fresh Jumbo Crab Cakes with Remoulade Sauce on a Kaiser Roll Served with Citrus Slaw and French Fries. Lamb & Beef cooked Rotisserie Style Served over Pita Bread with Tzatziki, Sumac Salad (Tomatoes, Onions, Parsley, Lemon & Sumac) & Potatoes or Rice. Marinated Chicken Served over Pita Bread with Yogurt Sauce, Feta Cheese, Sumac Salad (Tomatoes, Onions, Parsley, Lemon & Sumac) & your choice of Greek Potatoes or Rice. Ground Beef, Eggplant & Lamb served with Cumin Scented Basmati Rice with Toasted Pinenuts and Yogurt Sauce. Marinated Chicken Breast with Chili, Cumin, Cinnamon, Paprika & Cilantro. Sauteed & Served with Moulkia Sauce. Moulkia is a Green Vegetable similar to Spinach. Sauteed Rainbow Trout Fillet with a Lemon Butter Sauce and Caper Berries, Served with Crispy Polenta, Pasha's Creamed Spinach and Broccoli. Marinated Grilled Lamb Kabob with Vegetable Skewer, Brown Rice & Spicy Poblano Puree and Yogurt Sauce. Marinated Chicken Breast skewered with Vegetables Served with Basmati Rice & Spiced Carrots. Grilled Marinated Chicken Breast served over Basmati Rice with Golden Raisins & Yogurt Sauce. Tender Cubes of Lamb with our Spicy Tomato Sauce over Garlic & Butter Seasoned Bread, Rice. Shrimp and Scallops Grilled & Served w/Brown Basmati Rice, Fennel Puree and a Spicy Orange Vinaigrette. Served with Roasted Red Bliss Potatoes, Pasha's Creamed Spinach and Husham's mild Red Chili Sauce. Pomegranate Glaze, Spiced Carrots & Basmati Rice. Lamb Chop, Kafta Skewer (Ground beef)& Chicken Breast w/Brown Rice & Slow Cooked Green Beans. Seasoned Ground Beef served with Rice, & Yogurt Sauce. Lightly seasoned Fresh Lump Crab Meat with Citrus Slaw, Remoulade Sauce, Basmati and Fennel Puree. Tender Cubes of Lamb Served with Brown Basmati Rice, Golden Raisins & Yogurt Sauce. Same as Lamb Ouzi, but with Moulkia Sauce and Cumin and Pine Nut Basmati. Marinated in Olive Oil, Lemon Juice & Garlic. Served with Roasted Potatoes and Pasha's Creamed Spinach. Shrimp Sautéed w/ Middle Eastern Spices, Garlic, Tomatoes & Peppers. Served with Rice. Roasted Onions & Peppers & Broccoli. Grilled Chicken w/ Jalapenos & Red Onions. White Pizza, Spinach, Feta Cheese & Tomatoes. Ground Beef, Onions & Parsley with Tomato Sauce & Mozzarella Cheese. Cheese Pizza with Gyro Meat Topped off with Feta Cheese & Chopped Parsley. Fried Eggplant & Zucchini with Tomatoes & Spices. Two Vegetable Kabobs served w/ Falafel Patty over Rice. Green Lentils with Spices, Rice, Pasta Garnish, Fried Onions & Garlicky Tomato Sauce. Tomato Sauce with Garlic & Basil. Cream Sauce with Applewood Smoked Bacon, Mushrooms & Parmesan Cheese. With Balsamic Roasted Tomatoes and Sun dried Tomato Sauce. With Sauteed Shrimp, Italian Sausage and Pesto Cream Sauce. Breaded Chicken Breast baked with Marinara Sauce and Mozzarella Cheese. Served with Spaghetti. Excellent as usual. Our out of town guests (who'd never been here before) loved it. I went here for the first time for lunch with friends who go often. Being mostly vegetarian, I wanted to try the koshari, which sounded great and I had never heard of it before. Sadly, the server came back from the kitchen saying it wasn't ready (presumably the lentils needed pre-cooking), so I ordered the vegetable kabobs with falafel and rice. The falafel patties were nicely spiced and crisp, and the veggies were good. The portion was generous enough to take home half. I'd love to go back and try the koshari when it's available or something else vegetarian. I really like this small, tucked-away-in- a-small-mall, restaurant and have been there many times. The menu is interesting and the quality of the food varies depending on who's in the kitchen, ranging from top tier gourmet quality to over-cooked and uninspiring. Having said that, the food is never, ever bad and the cozy environment, friendly and efficient staff, and the "welcome, stay as long as you like" attitude makes it ideal for any peoples who want an enjoyable dining experience. Great gypsy jazz music on saturday night plus excellent food and service made for a wonderful evening and a value too. The food was good. The portions generous. Our hostess was attentive. We'll try again on a Saturday night when there is music! Saturday nights are gypsy swing jazz nights. There are 5-6 bands that rotate each Saturday. HC/DC is a great band to see here. Decent food choices cover a range of Mediterranean dishes (hummus appetizer plate is nice, gyro platter, seafood dishes, and pasta dishes). Everyone in our group enjoyed their meal. Not much of a beer selection. We went Bistro 29 for a live Jazz performance by a group called the Hot Club of Baltimore. The music was very good Gypsy Jazz. As I understand it, Bistro 29 is providing live music every Saturday night between 7:30PM and roughly 9:30. At this point there is no cover charge. The space is relatively small and tight and the ambiance, I would call "American Midwest neighborhood diner. " For the show they turned off one of the two basketball televisions. However, the menu is fairly extensive and quite varied. In addition to many of the standard American items there was curry, kabobs, and dinner salads. We all agreed that the quality of the food was above average and the servings generous. The servers were busy, but polite and effective. Considering the live music, decent food, and reasonable price, this is very good Saturday night out. We will be checking to see if the weekly music group interests us, and return -- until this place succeeds to the point that we are crowded or priced out!! It does help that we can reserve a booth with Open Table. Always a pleasant experience and the food is reliably good. Staff is friendly and attentive, though they sometimes have too many tables per waiter. The Greek salad and soups are winners here, with other tasty menu options,cocktails are well mixed, and the renovated interior interesting and attractive. We still prefer the original name, Pascha Cafe. Loved the Calamari and the live hot jazz! Lamb kabob outstanding flavors, excellent dish overall, chicken also very good; tomato soup excellent and salad tasty a big. Very good waitress. Enjoyed - worth the drive from S Arlington to North! Bistro 29 is our go to place in Arlington for a good reasonably priced weekday dinner. Their menu is quite varied and Old Dominion beer on tap. Food is delicious, servers and owner very nice, great experience! We love the entire menu, but especially look forward to the crab-stuffed shrimp when it is offered as a special. The atmosphere is casual and the crowd comes mainly from the surrounding neighborhoods. It is family friendly, which we appreciate, but to avoid the occasional screaming kid, I suggest coming on the later side for a quiet dinner.